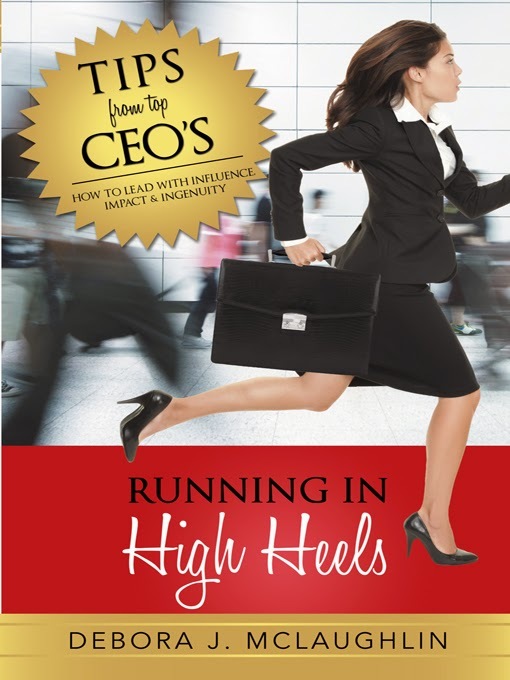 Today we are interviewing Debora McLaughlin, author of the business/leadership book Running in High Heels. A business leader who experienced leadership in the trenches of a male dominated high tech industry selling IT solutions to fortune 500 companies in NYC and Boston. Combining an expertise in business and psychology (an APA board certified psychotherapist) with executive coaching (company opened in 2003) to help leaders be more effective with people, performance and profitability. Describe the purpose of Running in High Heels in a few sentences. The leadership parody is shifting to one of inclusion, empathy and creativity, traits thought of as feminine (and learnable by men) and for the first time business research supports that women in leadership and having the most positive effect on the bottom line. The fact is, there’s never been a better time to be a woman in the business world. There have never been more opportunities for smart, talented women who want to lead. And you don’t have to trade your Jimmy Choos for wingtips to do it. Any women who works in business or has her eyes set on leadership. Compared to your last book, “The Renegade Leader,” your new book focuses on women leaders, from CEOs to designers. What inspired you to write a book focusing on successful women? Both books talk about culture and influence. I felt women needed to hear a message, that they don’t need to change to succeed. I feel Running in High Heels leads in where Lean in Leads off, it offers the practical strategies to lead in its L.E.A.D Forward formula but more importantly gives women the permission slip to be themselves. Women want to succeed but are asking the question “how”. By keeping the female in female leadership they can succeed by leveraging their female leadership advantage. In Running in High Heels, you bring up the idea of ability of women to Leverage the Female Leadership Advantage.™ Tell us a bit about this concept. We women, we’re collaborative. We’re consensus-builders. We’re great communicators. What we might not realize is the fact that these qualities – qualities that are naturally present– gives us a unique advantage in the business world. It’s all about using your natural powers of persuasion to align others to your vision, build collaboration through your sense of connection and relationship, and turn not only heads, but challenges into opportunities. I was saddened to hear that so many women at the top from CEO’s I’ interviewed or from the research done on others like Tory Burch (who I just saw speak in Boston) or Adrianna Huffington’s ideas were initially discarded or they felt they had to work really hard or not attend a child’s daytime school event because they felt they would be viewed as less powerful. If women are bringing in bottom line performance how can we help to balance the commands of work with the flexibility to live a full life too? A lot of leadership books are just straight narration. You use a mixture of interviews, case studies, etc. What made you decide you to approach the material from this angle? When my clients heard I was writing the book several wanted to give it “voice.” I also had not walked in a women’s CEO shoes although I’ve coached many of them, I wanted to offer insights from a coaching, leadership perspective as well as that of an up and coming 28year old leader to that of a seasoned CEO. You have a unique background, with experience in neuroscience, PR, consulting, among other fields. How do you think this eclectic background has helped in your approach to leadership? My business experience helps me to drive results, increase profits, reduce costs, meet organizations goals, how I do my work is through leading with heart, motivating and engaging people to their highest levels of performance and positivity so their brilliance can shine. The psychology and neuroscience skills help me to do that and to quickly uproot the beliefs, fears and inner critic that every human faces on the path to success. What first got you interested in helping others with their leadership goals? When I first opened my doors I was surprised about the amount of executives who came to me that were managers, regional directors and team leaders who were burnt out and wanted to leave their organization. My heart breaks to know the failure rate of big business, many of whom I used to work for ( digital) and to see when a dream closed behind the closed door of a small main street business. I realized that the only way I would have the biggest influence and impact in business was to empower leaders and to create sustainable growing businesses as a result. Tell us about your Renegade Results program. I love to work with companies and leaders who are innovative and have dreams of fast growth. My results programs focus on working with executive leaders to communicate their vision effectively so that they gain the buy in of their people and to create an engaged and positive work culture so the company meets its vision faster and with great results. My clients usually distinguish themselves in their market and as a result of a great work culture, leaders find time for themselves, to dance on the beaches of bali, to take a 4 week vacation and the company still is standing in their absence and to be with their families. I also like to give them the creative space they need for their next innovative idea! How do you think reading Running in High Heels will impact people? and project a seasoned, credible career presence. -Gain visibility and recognition for your accomplishments. -Build a reputation as a leader, expert, or go-to person. -Navigate organizational politics with savvy. -Create your sphere of influence. -Leverage your network to gain access to hidden resources. -Live your life on purpose with conscious conviction. For those who are lingering in the shadows, waiting for a permission slip to show up fully in life, consider it written, it will encourage them to let their brilliance shine. I am putting resources on my website to support them and it is my plan to build a community of women who lead. A hot topic I’ve been discussing with leaders is the shifting demographics in business, the retirement of the baby boomers yielding the way to Gen Y and X. There is a much worry about the younger generation not having the collective intellect of the retirees and worry that boomers are not mentoring those below them. My take…perhaps its time to develop a new language that is not generational but is of shared values, a shared culture, shared vision and develop workplaces where creativity is allowed at all levels. Breathing life into organizations is what has made my clients achieve unprecedented results; it is what will be needed to be innovative and sustainable for the future. It allowed me to go through my own transformation. I think I wrote it 3 times much to my editor’s dismay. The first version was light and comical filled with heel metaphors, the second had an academic voice adding in the “how to” practical strategies, the last one rounded it out by fearlessly expressing my own story of how I learned that in life only you can step forward and claim your space and sometimes that means stretching into the uncomfortable place of the unknown and sometimes that means leaving what you know behind in order to step forward. Writing Running in High Heels gave my true authentic voice its expression and allowed me to own my full self as a woman, a leader, a business owner and to embrace my own bunions and imperfections along the way.